Greening Penrith | Penrith BID - Improving the economic potential of Penrith, Cumbria. The Greening Penrith initiative has benefited the look and feel of the town and culminated in us winning awards both nationally and regionally respectively at Britain in Bloom and Cumbria in Bloom.This project was only possible because of the involvement of the BID and gives the town a sense of pride in its appearance, not just in the Summer months. We encourage all businesses to get involved and show their Pride in Penrith! All will be green and blooming ready for June, so don’t delay to order your basket as we have to nurture them for several weeks before delivery to your door. 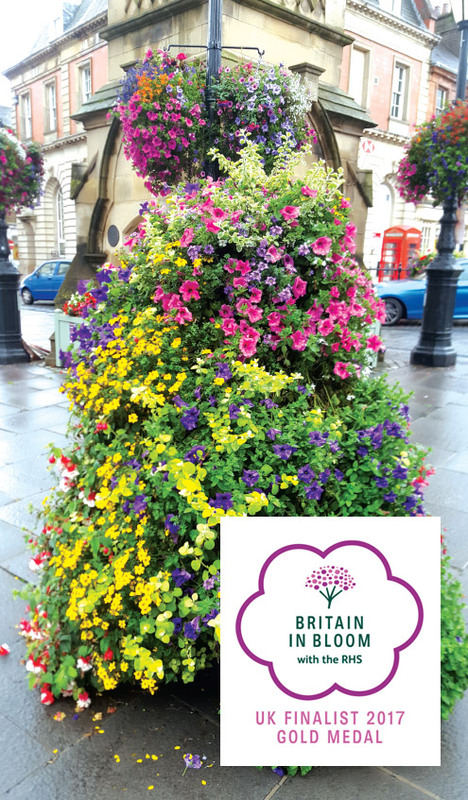 We offer a selection of greening options to make your business bloom: Town Centre Planters, and pre-grown 16” hanging baskets which are watered throughout Summer and can be supplied with and without a bracket. What’s in it for you? Apart from making the town look lovely, if you commit to help with our town centre planters your business will get full acknowledgement in the Herald (1 edition), a plaque on your sponsored item for 12 months and the planted area will be fully serviced throughout the season. Download our leaflet on the project here.